This is the first in a series of essays on the regulation of capitalism. With them I hope to convince you that we can move toward a system of capitalism that maximizes human wellbeing, while minimizing regulations that restrain its many benefits. In this essay I start with the example of the tobacco industry. In subsequent essays I will demonstrate how the principles that underlie the problem of the harm that the tobacco industry does are just as applicable to the marketing of alcohol to young people, fossil fuel consumption, the pharmaceutical industry, the arms industry, and the financial system. The problems involved in all of these areas can be understood in terms of the principles from three different fields: public health, economics, and evolutionary theory. Let’s start with the fundamental question in public health: What is the impact of a practice on the health of a population? In the case of cigarette smoking, epidemiologists have established that smoking is the number one preventable cause of disease and death in the United States and it is rapidly becoming that deadly in developing countries as the tobacco industry has extended its marketing to those countries. 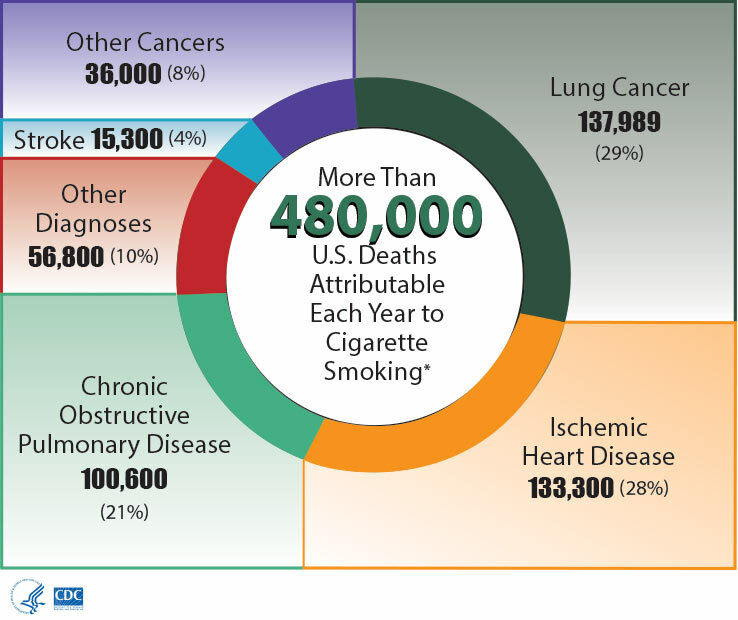 In the U.S. about 480,000 people die each year due to cigarette smoking. 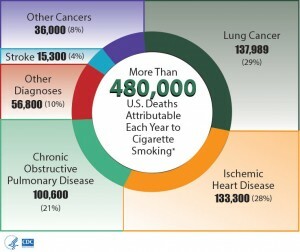 In the U.S. about 439,000 die because they smoke and another 41,000 die due to their exposure to other people’s smoking. To illustrate the extent of carnage due to cigarette smoking, tobacco control advocates often say that it is as though two Boeing 747’s crash killing everyone on board every day of the year . These facts can also be viewed in economic terms. First, the marketing of cigarettes involves negative externalities. That is, the market exchange in which smokers buy cigarettes from tobacco companies have harmful effects on people who aren’t a party to the exchange. There are the losses to the smokers’ family when a smoker dies prematurely. And there are the deaths of 41,000 people each year who are exposed to others smoke. Moreover, the United States incurs approximately $300 billion a year in the cost of treating smoking related illness, and the lost productivity due to sickened smokers. Second, economists have also identified information asymmetries that can harm the buyer. In the case of cigarettes, tobacco industry marketing convinces young people that smoking will make them more popular, but it fails to inform them about the harmful consequences of smoking—facts which the tobacco industry has been aware of for more than fifty years. In the case of the already addicted smoker, the industry has systematically mislead smokers by convincing them that so-called low tar and nicotine cigarettes would reduce their risk of cancer and cardiovascular disease. (See my Written Direct Testimony, in U.S. vs. Philip Morris et al. 2005). A third factor involved in the marketing of an addictive product such as cigarettes is the fact that although a smoker might, in the abstract say that in the long run, they would rather be a healthier nonsmoker, their preference in the moment will be to keep smoking. Finally, economists have noted the tendency for a small number of firms to dominate a market. This so-called oligopoly, often results in the firms colluding to benefit the firms at the cost to the consumer. In the case of the tobacco industry, they have a long and well-documented history of colluding to deceive the public about the harm of cigarettes. By enumerating the illness and death that are caused by smoking, we can precisely gauge the cost to society of a given market exchange and thereby order our priorities so that the most common and costly harms to society can be reduced or eliminated. In subsequent essays, I will apply this same analysis to the marketing of alcohol, unhealthful foods, fossil fuels, pharmaceuticals, certain financial instruments, and guns. In the case of cigarette smoking, the marketing practices of the tobacco industry have been shaped and maintained over the past 100 years by their contribution to profits. 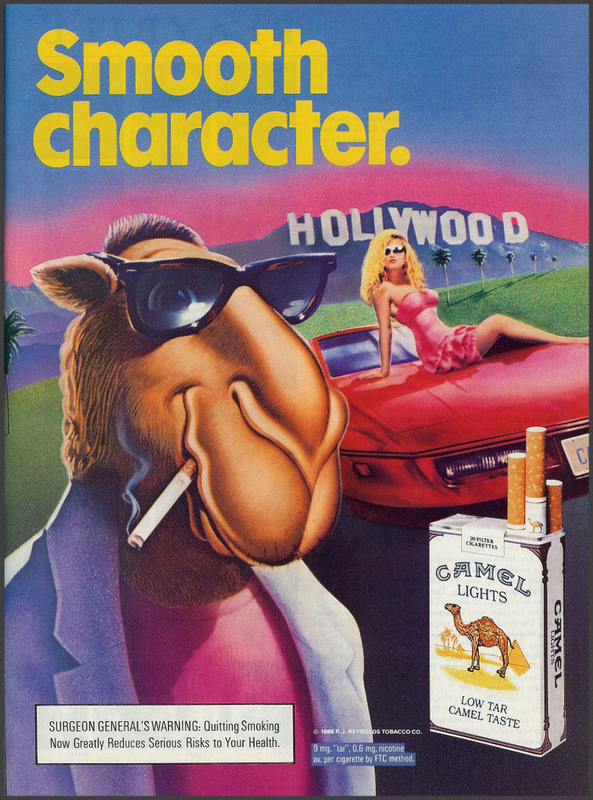 Milestones in the selection of innovative marketing practices in the tobacco industry included their successes in increasing the number of women who smoke, the Marlboro campaign that captured market share through the association of the iconic Marlboro man with rugged individualism, and the success of the Joe Camel campaign in wresting market share from Marlboro by associating Camel cigarettes with Joe Camel, a charming cartoon character who was, as one youthful smoker put it, “…the type the babes love” (page 338 in my Written Direct Testimony, in U.S. vs. Philip Morris et al. 2005). I begin this series of essays with the example of smoking because it is with the tobacco control movement that we have begun to evolve effective methods of countering corporate practices that affect health and wellbeing. Over the past thirty or so years, the facts I have enumerated have been instrumental in forging a cultural movement to reduce cigarette smoking and its harms. This exemplary instance of cultural evolution has been shaped by the selection of increasingly effective practices based on their consequences in reducing smoking. The movement was driven by: (a) the mounting evidence about the harm of smoking that epidemiological research provided us; (b) innovative communication of the epidemiological facts (e.g. two Boeing 747s…); (c) creation of advocacy organizations that garnered pubic support because of the evidence of harm of smoking; (d) the implementation of policies that increased the cost of cigarettes, prohibited smoking in an ever growing set of venues, restricted marketing of cigarettes, and changed norms about smoking; and (e) litigation which led to further restrictions on marketing and increased the costs to the cigarette industry. In subsequent essays, I intend to show how the public health, economic, and evolutionary principles involved in tobacco industry practices and the practices of the tobacco control movement are applicable to all of the other problematic practices I listed above. Scientific principles are like spotlights. They bring our attention to aspects of our world that were heretofore invisible. When we combine these principles from three different fields—public health, economics, and evolution—we can shine a light on myriad ways in which many current capitalistic practices harm human wellbeing, and more importantly what can be done about them. These tools provide the framework to reform capitalism in ways that curtail practices that harm us, while at the same time preserving the use of market forces to foster innovation and productivity. Biglan, A.(1995). Changing cultural practices: A contextualist framework for intervention research. Reno, NV US: Context. Wilson, D. S., Hayes, S. C., Biglan, A., & Embry, D. D. (2014). Evolving the future: Toward a science of intentional change. Behavioral and Brain Sciences, 37, 395–416.